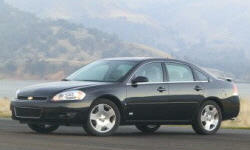 Why the 2007 Chevrolet Impala? Usually one of more affordable family sedans available. Performs well in crash safety ratings. Braking, however is just fine, and problems often develop with brake rotors on these cars. Very smooth, classy feel to ride. Long wheel base. HUGE trunk. Ample room in the vehicle, definitely a large family sedan. However, cabin space is not as spacious as it could be for such a large car. Always a top incentives car for GM. They sell a lot of these, mainly because they attack a price point and incentivise the H-E-double hockey sticks out of them. Why Not the 2007 Chevrolet Impala? Only get about 25 mpg on interstate with the 3.9 Active fuel management is a gimmick in my opinion and older GM cars with a V6 I have driven have been better with fuel economy than the 3.9. GM vehicles are notorious for heavy depreciation. Very hard to sell for a good price when used, so plan on keeping it for a while! Insurance is fine, but those with the SS model will pay hefty premiums. I have had 4 service items performed within the first 3 years of ownership. Unremarkable reliability. GM has had a terrible reputation, and think that is well documented. I.E. Bankruptcy, government bailout. Seems to suffer in handling, perhaps because of the long wheel base. Turn radius is not impressive. Not a good car if you park in cramped parking garages a lot.